What I love about West Footscray, is just as you 'get it' (like yesterday's 'green' themed community members proudly showing their Tank Water usage), you are surprised by the unexpected. Some parts of the suburb is very predictable, gorgeous houses with new renovations out the back, lovely veggie patches, tank water signs... beautiful olive trees set up by the council, wide roads and lovely footpaths and dog parks... Total suburban, right? And then there's unexpected and interesting things to see, like this motorhome! It's huge & dusty black, has a kitchenette (not that I snooped too much) inside with a little hand gel dispenser on view! And at the moment is parked in our seemingly quiet 'well to do' street. Now there's also a lot of other unexpected things around our street too, but it makes me so happy that not everything is picture perfect all the time. I haven't harked about David Lynch for a while, growing up perhaps! But his opening scene in Blue Velvet is the perfect neighbourhood, the white picket fences and lawns... with seemingly happy and friendly families all in their perfect homes... but then Lynch then dives down under the landscaped lawn and water sprinklers to show the dirt and worms and the 'real' grit of suburbia. When I walk around my part of Melbourne ... I see this in the unexpected things lying around, and it makes me so happy that everything is not too shiny... too perfect... you know what I mean? Also, it's not even hard rubbish time but someone has just left their old tv on the grass to the right of the old motorhome too... there's a lot of mystery around the place, in people's yards and in the graffiti (usually postering graffiti too, so quite labour intensive!) and I love it. Totally! Even things look perfect on the outside, you know it's just a facade. It's nice to have a reminder, esp. 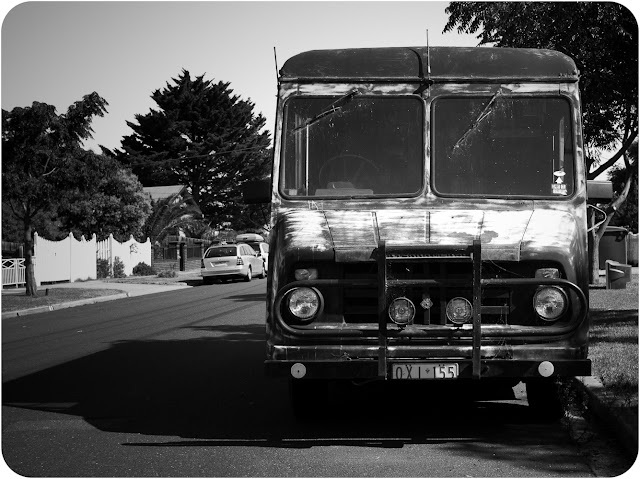 a gentle one like that truck, that there is a wildness and unpredictability under the surface. You've totally fallen for Melbourne's charm. I miss it sometimes.